The United States will not be represented at the World Cup this summer. It's the first time the nation has failed to qualify since Mexico '86, and a massive setback for the growth of a sport still playing catch-up on American soil. During the 2014 World Cup, an estimated 25 million people watched the team's 2-2 draw with Portugal, beating viewership for the NBA Finals that same month. For just a few days, goalkeeper Tim Howard's heroics stood alongside the great LeBron James in the nation's sporting consciousness. It seemed like the perfect platform for the men's game to build upon, alongside the flourishing profile of Major League Soccer. Instead it was followed by what Sports Illustrated called "the most embarrassing failure in US soccer history". Now, as part of its efforts to emerge from this nadir, US football is turning to wearable technology. A new partnership with Irish firm STATSports will initially equip 6,000 young players at Development Academy clubs with the APEX GPS pod. The elite tracking device, which is already used by a number of professional clubs in the English Premier League and across other professional sports, sits inside a compression vest and tracks over 50 metrics pertaining to movement and heart rate. The tracker will assist with the physical development of players through training, help coaches tailor midweek drills with an eye on match day freshness, and raise red flags with medical staff hoping to spot potential injuries before they happen. 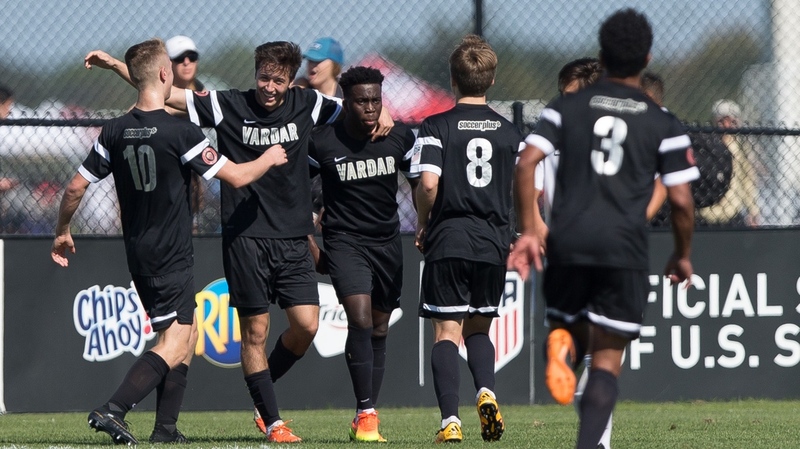 James Bunce, the high performance director for US Soccer, told Wareable: "The biggest advantage for a coach is ensuring players are continually pushed physically in a way that stimulates positive responses in their physical development." Among the metrics tracked is the High Metabolic Load Distance data on things like acceleration, deceleration and high-speed running. APEX also focuses on number of sprints, max speed, and total distance, while using heart rate data and impact data to marry movement to the overall strain on the body. In terms of injury prevention, data points like step balance are particularly clever. "APEX allows you to look at left or right load balance. It splits each move into how much you're pushing off your left and right," James Bunce, who previously worked as head of performance director for the EPL, explains. "There's very good evidence to show when balance becomes abnormal, players are trying to prevent loading on a certain side of the body. That's often a factor in carrying some sort of knock or injury." The wealth of data provided by the APEX Team Series wearable will be available to players and their clubs. Some of the intricacies of the data flow are still being worked out ahead of the roll out. However, eventually that data will be featured on national leaderboards, allowing players and clubs to measure their talent against counterparts around the nation. It could also have far reaching ramifications in scouting and recruitment, as teams look to boost their roster and idenfity future stars. "It'll allow these young athletes and their parents to get an idea of where they're at physically," says STATSports co-founder Sean O'Connor. "They'll be able to look at metrics like their power, their explosiveness, distances and speed, it'll give them a really good handle as to where they. The app will help create drills that will help [players] improve and focus on specific areas in order to improve those metrics. "As this grows, the long term view is players will be able to see where they are in terms of Under-16 central midfielders in the whole country, for example. They can benchmark themselves alongside some of the pro teams and the national teams in US football. "It also becomes a very useful scouting tool and [gives recruiters] the ability to look the make up of each area in each playing position and see there are six players in the country who are as good if not better physically than what we have here." The partnership with STATSports is worth a reported £1 billion and promises to create one of the largest datasets in world football. Professional men's and women's teams will also be part of the partnership, and while the company will offer its wearable tech to academies, it has confirmed that it will not collect player specific data from academy players. STATSports' APEX GPS wearable is designed to focus specifically on the physical side of the player development. There's nothing here that assesses the player's technical or tactical performance in training or during matches. The physical attributes of a player are only part of the equation, but perhaps an increasingly important part of the modern game. "I know the comeback around that will be the technical side," acknowledges Sean O'Connor. "This isn't a product that will assess the technical ability of the players, but it is something that will assess the performance attributes of players." Is there a risk tools like APEX will encourage coaches and recruiters to place too much emphasis on elite-level athleticism over ability? "It's a whole evolution of the game," James Bunce says. "It's not that we suddenly just have more physical players pop up, it's their exposure to good training to higher standards to performance-based decisions around training that pushes these players to develop these physical attributes from an earlier stage. "We're not trying to find the top athlete; we're looking to develop all the players in the environment to reach the highest levels of physical development. GPS should be used to encourage an environment every day where players are pushed and stretched to develop physically, but also technically, tactically and psychologically. "Ultimately, at end of the process, that will develop that fully-rounded player ready to participate at the highest level. When we go through the training and teaching of the sports science involved in STATSports with clubs, we won't be saying, 'if a player hits 1,000 metres of high-speed running in a game, he's your star player.'" Bunce is also conscious of the dangers of ranking young players based upon their physical attributes, cautioning that some don't fully develop until their early 20s. While STATSports' APEX GPS pod will help coaches identify potential, "making decisions based on how far they're run or how fast they've accelerated means you could miss out on a really world class talent," he adds. To balance the focus somewhat, US Soccer works with Opta, which monitors every Development Academy game from Under-15 to Under-19 levels. It provides technical data on common metrics like pass completion percentage and final third entries. Combined with the insight that'll be provided by STATSports, the Federation is creating an holistic approach that yields "a quite exciting amount of data," Bunce says. "The Academy has so many players and so many clubs, that it's probably the wealthiest data set in that area in world football," he added. Will the wealthiest data set in world football translate to an uptick in the US team's performances over time? Even before the APEX GPS devices are gifted to young players, there are already signs things are on the up for US Soccer. While the men's Under-23 teams failed to qualify for the last two Olympic Games, the Under-17s reached the quarter-finals of last year's Under-17 World Cup, before a defeat at the hands of England, the eventual winners. Some of the kids who'll initially benefit from the roll out of STATSports', partnership could even be part of the campaign to see US Men's National Team back on the grandest stage in four years' time.